It's been a while now since I've done a giveaway so I figure that now is the perfect time. Creme of Nature has been doing big things lately. First was the release of the Argan Oil line styling products, now the line has expanded to include shampoos, conditioners, and oil moisturizing products. The good people at Creme of Nature generously gifted me full size bottles of these amazing looking products. Instead of selfishly holding on to the products for my own personal use, I've decided to spread the love. So here's a breakdown of the products I'll be giving away to a few lucky readers. Oh, I should also mention that the products are new and unopened. CON Argan Oil Treatment-Helps repair dry hair, strengthens & prevents breakage. CON Strength & Shine leave in-Strengthening protein complex to protect against damage and heat styling. CON Moisture and Shine Shampoo-Gently cleanses hair without harsh, moisture stripping agents (sulfate free). CON Intensive Conditioning Treatment-Deeply infuses moisture, leaves the hair soft. CON Oil Moisturizer-Restores Moisture, adds shine, heat protectant. So here's how to enter. In order to participate in the giveaway, you'll need to follow the blog and send me an email to relaxedhairhealth@gmail.com with the "CON Giveaway" in the subject line. 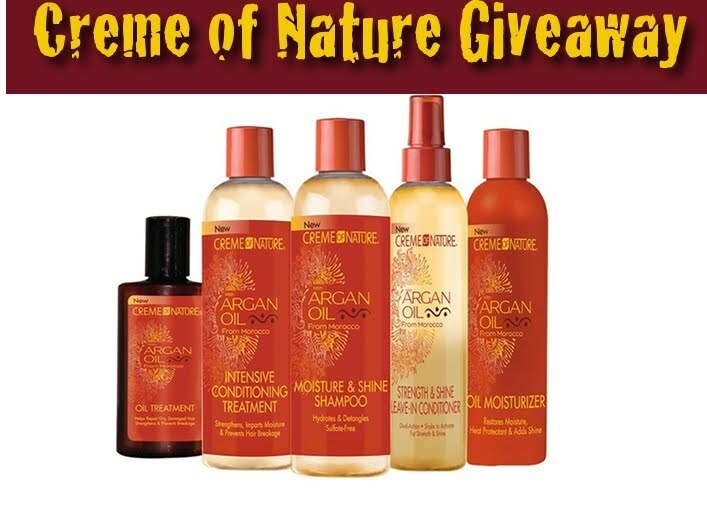 I will select one winner, bi-weekly, starting on Saturday May 14th until each product is given away. There will be 5 winners total! When a winner is selected, he/she will have a choice of which product he/she would like to receive of what's available. The final winner will receive the remaining product. Winners will be selected randomly. Once you have entered the giveaway, (by following and sending the email) you are automatically entered for subsequent drawings. This means you only have to send in one email to be eligible to win in each of the five giveaways. Individuals selected as winners will be omitted from subsequent drawings from this giveaway. Good luck to all of you! Follow and send your email now.